I recently opined about the trend in “found-footage” horror movies, a sub-genre which makes explicit reference to its own origins in the availability of inexpensive video equipment. But of course, not all filmmakers who pick up a small camcorder are interested in that kind of self-reflexive activity. Some just want to make a movie. 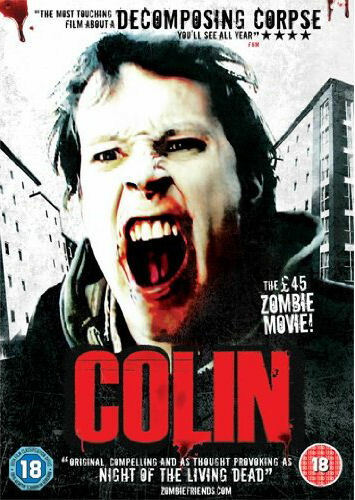 This week I stumbled on a very low budget British horror film (the filmmakers claim a £45 budget) called Colin (2008), which turns out to be one of the best non-George Romero zombie movies of recent years. I’m not sure that this kind of thing is what Coppola had in mind with his comment about the future of film being adolescent girls with camcorders, but writer-director Marc Price and his collaborators seem to have a cheerful do-it-yourself attitude which, combined with a genuine awareness of genre conventions and how to play with them, give Colin a freshness and emotional weight rare in this kind of filmmaking. Given that mainstream movies in general have become flashier and slicker in the past couple of decades, with audiences primed for technical polish (which often obscures conceptual and narrative weaknesses), it’s interesting to ask just where a movie like Colin fits in. It’s so relentlessly lo-fi that the images are often a real eyesore – this has nothing of the aesthetic richness of David Lynch’s INLAND EMPIRE for instance, a major feature also shot on low-end video equipment. Colin‘s images frequently break up into a blurry mess of pixels. In fact, a friend I recommended the DVD to turned it off after a few minutes because he found it unwatchable. But paradoxically, this coarseness is one of the film’s strengths. The seeming amateurishness of the imagery when combined with the strength of the narrative and the conception of the central character, gives it the peculiar sense of unmediated realism we get from watching home movies, the impression of direct access to the events being depicted. But Price’s film differs from the found-footage genre because he’s using his camera in a traditional story-telling way, not as an active participant in the film but as a detached observer of the story. While the technical quality of Colin, at least for me, adds to the conviction of the storytelling, what I really like about the film is the story itself. Price has chosen to remake the standard zombie film from the point-of-view of the zombie, and in so doing has gone one better than the masterful Romero, who has only hinted at the existential condition of the undead in his works (which are all more interested in the behaviour of the human characters in extreme situations). Colin is the grown-up stepchild of Bub from Day of the Dead, and Price’s unforced observation of the character (in a nuanced performance by Alastair Kirton) creates a poignant drama of loss and hopelessness. It`s a shock when we get to the big sequence in which an organized group of survivors attack and destroy a shambling cluster of zombies, among whom Colin briefly finds himself, to realize that we now completely empathize with the zombie rather than the humans. When the film comes full circle to show us in flashback how Colin himself became a zombie, we get a strangely tender scene in which it`s a very human act of love and compassion that condemns him. I suppose my point here is actually the same one I’ve held to for years: it’s not the technology used by filmmakers, the production values that money can buy, that makes a movie worthwhile. In the end, what really matters is the story being told and the narrative skills of the storyteller. This entry was posted in Review and tagged British Film, Digital Video, DVD, Horror. Bookmark the permalink.